Wormsley Park, Buckinghamshire; By descent until sold from the collection of John Fane, November 2009, as ‘Follower of Godfrey Kneller/Portrait of a Gentleman’. To view works by Dahl for sale please go to www.philipmould.com. 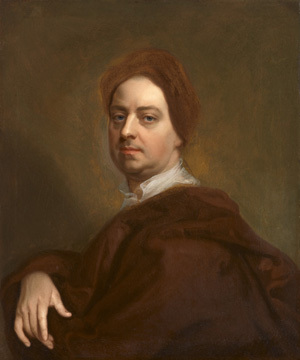 This previously unrecorded work is one of only a handful of known self-portraits by Michael Dahl, a leading artist in England in the late seventeenth and early eighteenth centuries. It is probably his last self-portrait, and seems to post-date a similar example in Gripsholm Castle, Sweden, which shows a slightly younger man. Dahl’s earliest self-portrait is in the National Portrait Gallery, London, a three-quarter length portrayal of the artist motioning to his brushes and palette that is one of the Gallery’s finest examples of the genre. All three works demonstrate why Dahl was recognized as Godfrey Kneller’s most talented rival in England. Either the present work or the Gripsholm example is the self-portrait seen by the art historian George Vertue, who in 1723 recorded a work by ‘Mr Dahl. a picture in a Cap by himself’. Dahl was born in Sweden, and trained under the court portraitist David Ehrenstrahl. Like many Swedish artists, however, he left for London (in 1682) in search of patronage after political turmoil in Stockholm reduced the wealth and power of the aristocracy. A number of Dahl’s compatriots saw England as being relatively stable and prosperous compared to many European countries, and more welcoming than France, for example, of the Lutheran faith then prevalent in Sweden. Dahl worked briefly in Kneller’s studio, but then travelled to Rome to study further, copying old masters and successfully seeking commissions from the exiled Queen Kristina of Sweden. This last fact may be explained by his secret conversion to Catholicism. In 1688 he returned to England, where he may have been hoping for support from the Catholic King James II. But Dahl arrived in early 1689, by which time the ‘Glorious Revolution’ had deposed James and replaced him with his daughter Mary and her Protestant husband William of Orange. Dahl did not portray the new monarchs, but did gain much patronage from the rest of the court, and in particular Prince George of Denmark, the husband of the future Queen Anne. Dahl’s portraits can today be found in numerous collections and country houses. They are, however, often misidentified, as the present work was, as works by Godfrey Kneller. Dahl has never had the benefit of a modern catalogue or biography, but his works are easily recognized, with their distinctive physiognomy and delicate finish. As is so often the case with artists and their self-portraits, Dahl has here taken far greater care over his own depiction than one of his conventional portraits. The head, while painted on a sketchy and unfinished background, is painted with particular finesse, and demonstrates why Dahl was one of the most fashionable artists in England.